Reflections on Fairness in Testing as Viewed by Test Makers, Test Takers, and other Test Stakeholders. 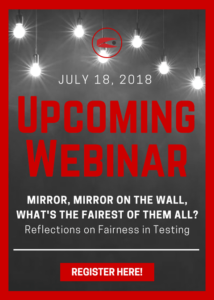 Join three of Caveon’s security experts, Dr. David Foster, Dr. Kelli Foster, and Dr. Sarah Toton, as they reflect on the current state of fairness in the testing industry and discuss how systematic unfairness negatively impacts test takers, test makers, and those individuals who rely on test scores to make important decisions. In this webinar, you will do more than acknowledge the “elephant in the room”, you will learn how to leverage new and innovative technology to improve the fairness of your exams, and you will receive practical tips for implementing this technology in your testing program. This webinar is free, and since your time is valuable, it will only last for 30 minutes. If you can’t attend, register anyway, and we’ll be sure to send you a link to the recording after the live session.